Hydroponics is the art of growing plants without soil. And, yes it is possible to grow plants without soil as long as you supply all the essentials. Controlling and maintaining the water reservoir is the most challenging part in hydroponics gardening for both the experienced and the beginners. Since plants are grown without soil, the roots are submerged in a nutrient solution. By itself this is sufficient but most people forget that plants need oxygen as well. To supply oxygen to the nutrient solution you need an air pump. Deciding on the best is not always an easy task, in this post; we have reviewed 6 of the best air pump for hydroponics and also provided a checklist of the factors you should consider. Why use the best air pump for hydroponics to supply oxygen? The lack of soil is replaced by water. Most people new to hydroponics are not aware of the essence of air pumps. Most of them will only settle for water pumps and a balanced nutrient reservoir. The water pumps only pump water to the system but there lack an essential component; air! Air is essential in any hydroponic system. Stagnant water is a good harboring place for bacteria and pathogens that might attack the roots of the plants. For this reason, you need a water pump, there is no way the system can operate without one if you want high yields from your plants. From basic third grade science, plants take in carbon dioxide in and excrete oxygen in a process known as photosynthesis whereas animals use oxygen and exhale carbon dioxide. In photosynthesis, plants use carbon dioxide, nutrients, and sunlight in the presence of chlorophyll to make glucose molecule. The glucose made is the running unit of the plant but; how is it broken down? Basically, plants carry our two processes: respiration and photosynthesis which are the reverse of each other. In respiration, plants use oxygen and excrete carbon dioxide through the tiny opening in the leaves (stomata). The oxygen is used to breakdown glucose into energy that is then used within the plants to carry out its functions. Plants need the energy to transport water and nutrients through the stem to other organs. This cannot be achieved without the presence of oxygen. For plants grown in the soil, the soil is well-aerated meaning that the roots get adequate oxygen supply. The same thing cannot be said about the nutrient reservoir in hydroponics, there is a deficiency in oxygen and it is for this reason that you need one of the best air pumps in your hydroponic system. Most hydroponic systems are used indoors since they are small enough to fit in available spaces and provide the convenience of easy monitoring. There is concern that quite a number of air pumps are rather noisy. This might impact on you directly by disturbing you as you sleep or work. Well, the good news is that not all hydroponic systems are noisy; you just have to be very selective on what you purchase. Other than air pumps you will also need some tubing and an airstone. These are not always necessary but to sufficient supply of air to the roots you need them. In tubing, it is recommended that you use black tubes. This is due to the fact that bright colored tubes can become bleeding for algae that end up using the oxygen and nutrients meant for your plants. Ensure that the nutrient solution is always evenly blended. The air pumps will be running continuously day in day out. For this reason, you must ensure that you purchase durable air pumps. Well, not unless you want to replace the air pumps every now and them. Even if it means going for something slightly expensive to get the durability you deserve, never shy off from it. A durable air pump will service you for long without the need to replace it. As mentioned earlier, quite a number of air pumps for hydroponics are very noisy. If the system is located outside this should not be an issue but if it is located indoors then we have a problem. It is recommended that you choose air pumps that run silently and there is quite a handful of them. If done right, hydroponics is supposed to provide higher yields. To ensure that you don’t incur extra cost you need to use air pumps that are economical in the sense that they consume less energy and have little to no maintenance cost. How big should the air pump be? This depends on the air to be covered. If you have a big system then you are going to need a big air pump. It is recommended that you purchase an air pump with wattage that equals the number of gallons of nutrient solution in the reservoir. Ideally, the recommended calculation rate is one watt for one gallon of nutrient solution. Different air pumps vary when it comes to features. Always check to see the features included, if possible go for an air pump with an adjustable airflow or multiple outputs. What is your budget limit? Expensive doesn’t always mean high quality and you can’t purchase what you can’t afford. 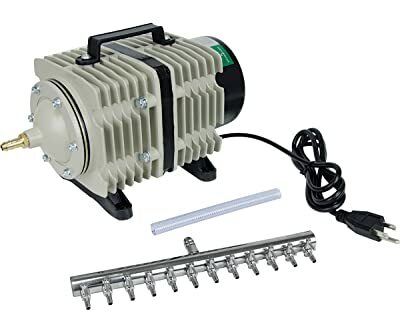 If you want to purchase the best air pump for hydroponics it is recommended that you don’t limit yourself too much to the budget. Go something high-quality that will serve you long enough. Even with all the information on the factors to consider and why you need an air pump for a hydroponics system, without being pointed in the right direction you are bound to make mistakes. In this post, we will review 6 of the best air pumps to use in your hydroponics systems. Read through and make a sound judgment on what suits you best. Our top pick for the best air pump for hydroponics is none other than the General Hydroponics GH2716 Pump. To begin with, the company claims that this is the only air pump in the world that is specifically designed for hydroponic system use only. The pump has 4 outlets with each outlet ¼ inch wide. This makes it ideal to use the pump in both small and large reservoirs especially given the fact that you can control the air flow. The pump can be split into two meaning that it can be used to supply air to 8 reservoirs. The motor is designed for heavy duty and pumps up to 320 gallons of air in just 60 minutes this is more than twice what regular hydroponic air pumps can manage. It would be expected that such a heavy duty air pump consumes lots of energy, well this is not the case; General Hydroponics GH2716 Pump consumes less energy and requires little to no maintenance cost. If something gets damaged in the pump, you don’t have to replace it; the spare parts are readily available. General Hydroponics GH2716 Pump has a 1-year warranty. As the name indicates, the Hygger Quiet High Output 10W Aquarium Air Pump is super quiet. This is such a great deal given the fact that most hydroponic air pumps are very noisy. The air pump uses bearing motors that run using magnets hence reducing the vibrations. 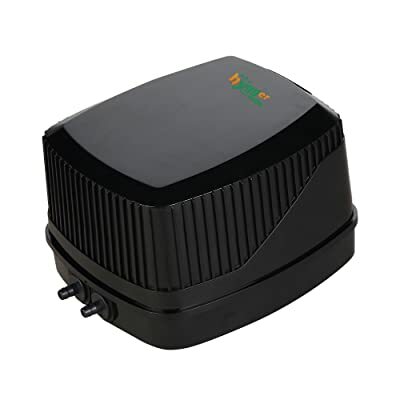 Other than that, Hygger Quiet High Output 10W Aquarium Air Pump is equipped with noise reduction gears ensuring that the pump is whisper silent. In terms of energy efficiency, only a few models can match the high output for fewer watts this model provides. It is suitable to use in 30-600 gallons of water. In hydroponics gardening, 600 gallons equates to a large nutrient reservoir. The pump has two outlets each 4mm wide of which the air outlet can be adjusted. The pump itself is made from stainless steel meaning that you can worry less about corrosion and rust. Hygger Quiet High Output 10W Aquarium Air Pump has excellent customer services always willing to assist. And, as if that’s not enough on top of the 1-year warranty they offer a 30 days money back guarantee if you are not happy with the air pump. If you have been in hydroponic gardening long enough then you must have heard of the Danner Manufacturing INC Supreme Oxy-flow Air Pump. Highly recommended for its energy efficient motor this is the hydroponic pump to go by if you want to save on your monthly electric bill. The pump has 2 outlets which have enough energy to supply two medium sized nutrient reservoirs. Noise is not an issue when it comes to Danner Manufacturing INC Supreme Oxy-flow Air Pump. The motor runs silently meaning that you won’t disturb your neighbors whenever you are oxygenating your plants. Danner Manufacturing INC Supreme Oxy-flow Air Pump is easy to use making it ideal even for beginners. There are no complicated settings, everything is basic and no prior knowledge on hydroponic air pumps is required. The pump is lightweight and accepts standard tubing meaning that you don’t have to incur extra cost purchasing special tubes. Even the best air pump for hydroponics find it hard to match the 400 gallons of air per minute of the Hydrofarm Active Aqua Commercial Air Pump. 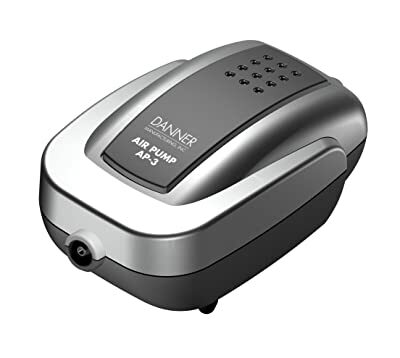 The air pump is designed for heavy duty and has 12 outlets. This means that the pump can comfortably oxygenate up to 12 hydroponic farms. Most pumps start off with high pressure but as time passes the pressure drops and the pumps become less effective. This is not the case with Hydrofarm Active Aqua Commercial Air Pump. The pump offers steady pressure throughout its course which is such a great deal. When it comes to energy consumption, Hydrofarm Active Aqua Commercial Air Pump only consumes 12 watts. This will cut on your monthly electric bill. 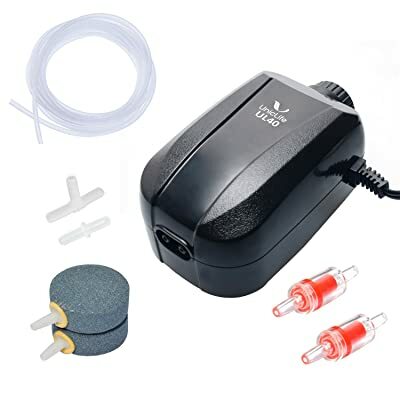 If you are in search of a multi-purpose air pump that will back for aq​​uaponics and hydroponics then you should consider purchasing the Uniclife Aquarium Air Pump. It has enough pressure to oxygenate 100 gallons of water. The pump has two air outlets and it has an option to regulate the airflow. This means that you can use the pump in small and large nutrient reservoirs. When you purchase most hydroponic air pumps you are forced to dig deep in your pockets to buy all the required accessories. Well, with Uniclife Aquarium Air Pump you are good to go immediately your purchase it. The brand offers all the accessories needed to get started in one package. What more could you ask for? 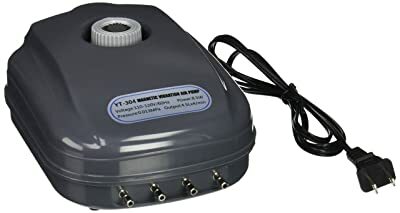 Last but not the least in our review of the best air pump for hydroponics is none other than SUN YT- 304 18LMP Aquarium Air Pump. This is an air pump with aquarium and hydroponic applications. The air pump has a special rubber that is specifically designed to ensure that the pump maintains steady pressure throughout its service life. SUN YT- 304 18LMP Aquarium Air Pump yields 18 liters of water every minute which is quite a great deal given the low energy consumption. It is also easy to use, in fact, all that is required of you is you plug the cable to power and you are good to go. SUN YT- 304 18LMP Aquarium Air Pump has 4 outlets and offers a 1-year warranty. Not designed for heavy duty. Hydroponics is a new farming technique where plants are grown without soil. Most people are not sure on what air pumps will work best for their hydroponic system. This article has reviewed in details 6 of the best air pump for hydroponics. It up to you to decide which suits you best! If you found the article useful kindly share it with a friend or two enlightening them on the same. The pump can be split into two meaning that it can be used to supply air to 8 reservoirs. 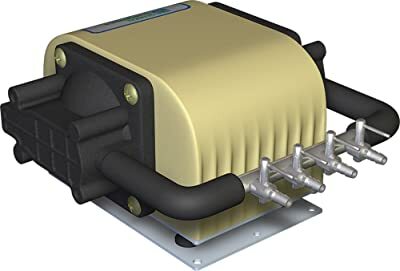 The motor is designed for heavy duty and pumps up to 320 gallons of air in just 60 minutes this is more than twice what regular hydroponic air pumps can manage. General Hydroponics GH2716 Pump has a 1-year warranty.